Mercedes-Benz BlueZero concept cars | What Car? 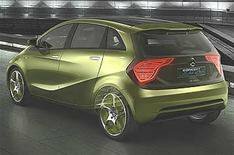 Mercedes-Benz is to reveal a trio of 'green' concept cars at the Detroit motor show. The vehicles will be badged under the company's new BlueZero range and use a combination of battery power, fuel cell and conventional engines. The BlueZero E-Cell has a lithium-ion battery capable of covering up to 120 miles between charges, while the E-Cell Plus uses a 1.0-litre turbocharged petrol engine to create a hybrid with a claimed range of up to 370 miles. The third new vehicle, named the F-Cell, uses a fuel cell. All three cars share the same design that allows the weight of the battery to be placed lower in the car. The use of this floorplan improves handling and reduces the amount of space required allowing a larger cabin area. This structure is based on the current A-Class's platform, which Mercedes will recycle and use for production versions of the BlueZero vehicles. The environmentally friendly concept cars will all be capable of 93mph, and reach 62mph in under 11 seconds. Mercedes claims its new liquid-cooled lithium-ion batteries can provide a 30-mile range from just 30 minutes of charging, with a full charge taking two hours and giving 240 miles. A limited number of fuel-cell vehicles will enter the Mercedes product line-up next year, according to the firm. Electric cars will follow in 2010.